This tutorial will explain what a balanced plied yarn is, and how to quickly and easily achieve it while you're plying. Thanks to articles by Rita Buchanan in the magazine Spin-Off, I was able to see how to check that a plied yarn is balanced while plying--without the need to keep a sample handy. I don't know about the rest of you, but I'm not organized enough to keep track of samples for as long as it takes me to finish some projects! What is a balanced yarn? Spinning is the act of transferring energy to fiber in the form of twist, increasing the friction that will hold the fibers together as yarn. If the twist is balanced in some way, the yarn won't kink back on itself, slant stitches in knitting, cause tracking in handwoven cloth, etc. It's easy to work with, feels as soft as possible for the fiber type, and doesn't distort the finished piece. There are two types of balanced yarns. One type is a low-twist singles in which there is so little twist energy that the yarn behaves essentially as if the twist is balanced. In theory, no singles with twist can truly be balanced, but in practice it works. The other kind, a balanced plied yarn, has the twist of the original singles balanced by inserting twist in the opposite direction while holding two or more singles together. If just the right amount of opposing twist is plied into the yarn, it will have no active twist left when you work with it. Evidence of unbalanced yarns can be seen in the photo here. The sweater's yarn had too much plying twist inserted. 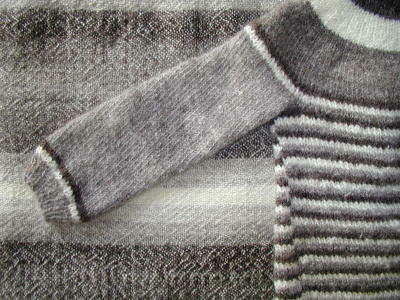 Though knitted in the round, the stitches clearly slant--readily visible here in the sleeve and in the 'seam' where the beginning of the rounds show the change of color for the stripes. The background piece was a shawl from a white two-ply handspun warp and shaded grays handspun singles weft. The warp yarn also had too much plying twist. After washing, that excess twist energy shows up in a phenomenon called "tracking" by weavers. Tracking is the little diagonal lines of yarn which pop up to the surface, but which are not due to the weave structure. This piece is in plain weave, which shows off tracking more than other weave structures, because the intersections of yarn are closer together, with less 'wiggle room' for the overtwisted yarn. Sometimes these can form interesting additional texture, but it would be best to be in control of it--to be able to spin a yarn which won't track if you don't want it. Notice I mentioned "active" twist, also called "fresh" twist. 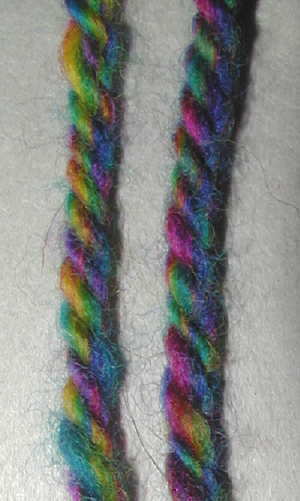 Some fibers, particularly wool, have the capacity to relax into the inserted twist. If allowed to sit under tension on a bobbin, skein winder, or other device, the twist will become "stale". Try this experiment: Spin a bobbin of yarn and leave it on the bobbin. Spin the same kind of yarn with the same fiber on another bobbin, and skein it immediately. Now skein the first bobbin's yarn. You'll see that the twist in the first skein / second bobbin is very fresh. The yarn kinks all over. The first bobbin / second skein is relaxed. Depending on how long it sat, and how much twist it has, it might also kink a bit, but it will be noticeably straighter. These skeins of singles yarn are all the same fiber, spun at the same thickness, with a twist angle of 25 degrees. 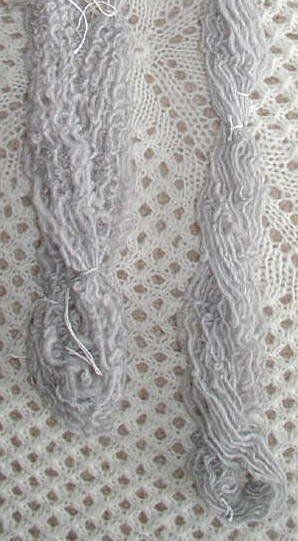 One was skeined immediately, the other was left on the bobbin for a couple of days before skeining. 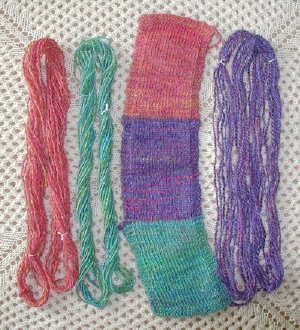 Which one had the most active twist when taken off the skein winder? Wool seems to be the most likely to relax quickly, and it's important to remember. Many spinning books recommend skeining the yarn, taking it off the skein winder, and looking at its twist back or lack of to tell if the twist is balanced. This is not accurate unless the skein is first washed and dried without blocking! When dried with blocking, the yarn is temporarily 'set', like putting your wet hair on rollers to make a temporary curl. As soon as the yarn is exposed to water again--even in the form of a very humid day, just like with human hair--the original twist, or lack of, will reassert itself, even if it's been woven or knit in the meantime. A yarn has to be spun before it's plied, therefore the spinning twist will always be a little older and more relaxed than the plying twist. If the plied yarn sat on the bobbin or skein winder for a few days before taking it off, causing the plying twist to relax as well, then it might be an accurate illustration of its balance. But if skeined and taken off the skein winder right after plying, the plying twist will always act more fresh than the spinning twist, and the yarn will twist back on itself in the plying direction even if it's actually balanced (unless there's much more spinning twist than plying). The most accurate way to determine if a yarn is truly balanced is to skein it and wash it, then hang it to dry without blocking. If, when dry, it doesn't twist back on itself, it's balanced. If it twists back, then there's either too much or too little plying twist to balance the spinning twist. Unfortunately, you have to spin the whole skein before that test of balance can be made! Another option is to spin a small amount of the singles you plan to use for your plied yarn. As soon as it's spun, pull it off the bobbin, double (or triple, quadruple, etc, depending on how many plies your finished yarn will be) it back on itself, and allow one end to dangle as the fresh spinning twist plies itself. This must be done as soon as the yarn is spun. Waiting as little as five minutes (at least for yarns that are mostly wool) will allow the yarn to relax a bit and the self-plying will not be enough to balance the sample. You will need to soak the sample in water and hang it to dry see the real amount of plying twist needed. This gives an accurate sample of balanced twist for that yarn, but now you have to keep track of the sample, even if you stop working on that project for a period. One solution is to tape the sample to an index card, with information about the fiber type and preparation, the size of the singles and spinning method, where the project is stored, etc, and keep the card in a file. A rather technical method of figuring how much plying twist to add to your singles is explained by Mabel Ross in her book The Essentials of Yarn Design for Handspinners. Mabel's work was groundbreaking, but very complex. It involves figuring out what percentage of the original spinning twist will create a balanced yarn when plying. Some writers provide tables based on various spinning wheel ratios, while others create complex formulas that are hard to follow (at least for me, definitely a calculator user :). I guess they describe the mathematical relationship between the spinning and plying twist, but they don't tell me how to check it in my yarn right now. Besides, treadling rates don�t work on an espinner! Needless to say, there's a simpler approach. It "came to me in a flash" when I looked at one of the illustrations in an article in Spin-Off by Rita Buchanan. Subsequent practice has proven over and over that it's simple and works in nearly every situation--certainly in every situation these other methods apply to. The first few times you do this, it helps to be plying a worsted weight yarn, with fibers of various colors in the singles. You may still need a magnifying device to help you see the slant of the fibers easily. The yarn shown here is a somewhat textured multicolored singles that I spun several years ago, and kept as a sample skein. I plied it back on itself much later, without using formulas, when the twist was very stale, and with no sample of it plied when freshly spun. It is quite balanced, and the areas of color clearly show this. Look at a singles yarn (muticolored, fairly thick singles are easiest--others may need magnification). Note the slant of the individual fibers in the yarn. While plying the yarn, stop periodically and look at it carefully by drawing a section off the bobbin (no need to break it off). Notice the 'bumps' on the yarn which are the singles coming to the top. If the plying twist balances the spinning twist, the previously-slanted fibers, viewed in the center of those bumps, now align with the yarn so they are parallel to it. If the fibers are not parallel, but slant in the same direction as the original singles, then you need a bit more plying twist. Treadle some more, and check it again. If the fibers are slanted in the direction of the plying twist, it's a bit over plied. Take a little twist out, and look at it again. This method works for any number of plies, and works for the final plying of a cabled yarn as well. There! No samples needed, no formulas, no washing the yarn when it's too late to make a difference. You don't even need to count treadles unless that's something you enjoy. Just look at the yarn periodically, and let it tell you if it's balanced. After you have plied for a bit, checking as you go, you will develop a rhythm for the combination of treadling and feeding yarn to the bobbin, and you won't need to check the balance as often. I check my yarn every time I change hooks on the flyer until I'm pretty sure my hands can remember what to do. Then I still check every two or three hook changes, to be on the safe side. A common question from students is how to balance ply a somewhat textured yarn. Obviously, since we're handspinners, we seldom produce perfectly even yarns in either thickness or twist. Some areas are going to be thinner, and some thicker. Thinner areas gather more twist unto themselves, taking away from thicker areas. How to balance that? I aim for an average. If most of the areas of the yarn which are fairly even in size are balanced, I feel confident that the whole skein will be balanced. Highly textured novelty yarns are often unbalanced by their very nature. A softly-spun singles plied with a tightly-spun binder yarn, for example, will never be balanced. Used in large areas, it may visibly slant or track, although the texture of the yarn will tend to obscure tracking. Fortunately, such yarns are rarely used in large areas. This set of class samples is too good to pass up, so I decided to include them as a further illustration of balanced and unbalanced plying twist. Each of the singles was spun to the same twist angle and thickness. Only the amount of plying twist varies, completely changing the way the yarn acts when used. Neither the yarns nor the knitted sample were blocked in any way. They were merely washed, and hung or laid flat to try without weights or pinning out. The purple yarn on the right is balanced. The yarn hangs without twisting back on itself, and the sample knit from that yarn is straight. The orange yarn is underplied and looks rather stringy close up--I couldn't take a picture that would show that much detail. The green yarn is overplied. It twists back on itself quite a bit. It's easier to add way more plying twist than way less plying twist than a given yarn needs, so this skein twists back more than the orange, and the knit sample slants more. The excess plying twist gives it a rather hard handle, almost wiry. Only the purple yarn has a pleasant handle in the skein, as well as a squared knit sample. Hopefully these pictures make it clear how to make sure your yarn is balanced in the easiest possible way. The only drawback to this method is when spinning very fine yarns where every fiber is the same color. Even under magnification the slant of the fibers will be difficult to see. In that case, I recommend Rita Buchanan's method of making a plied sample from freshly spun yarn and plying to match it as closely as possible. It's a little trickier to do, but if you can't see those individual fibers, it's the best alternative in my opinion.